The Chester Ladies’ Choir Celebrating Sixty Years of Song! 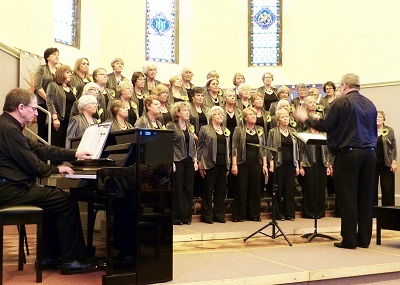 I make no apologies for singing the praises of The Chester Ladies’ Choir! We are a fabulous group of ladies who meet once a week to exercise our vocal chords and have a good old get together at the same time. 2015 is a very special year for us. Established in 1955, we are celebrating our 60th year next month with a Diamond anniversary concert in Chester Cathedral on Saturday 16th May 7:30 p.m. Our guests will be The City of Chester Male Voice Choir, The City Of Chester Brass Band and Welsh composer and entertainer Robat Arwyn. Matt Baker is Master of Ceremonies. I’ve been in the choir on and off since the early eighties and have seen many changes, including working with a couple of musical directors: Rodney T Jones and before him, Peter Dalton, although Brenda Harper, our longest serving member could name some others! This year, Rod is leaving us and we will be welcoming our new MD David Bebbington from next month. At our Diamond Concert we will be performing a specially commissioned piece from composer Robat Arwyn. This is a world premiere and we’re sure it will be a huge hit! Back in 1955 the choir was known as the Upton Ladies’ Choir and had twenty five members under the direction of its founder Ronald Hugh Smith. These days, we have around sixty members and regularly perform concerts in and around Chester and other parts of the UK. Our latest tour was to Bath, and previous tours have included Newquay in Cornwall, Bangor in Northern Ireland and we’ve been as far afield as Malta where we performed in the world renowned M’dina Cathedral.